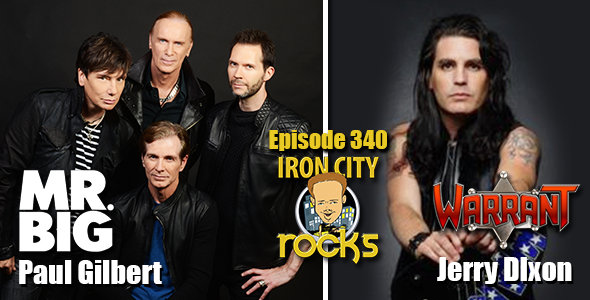 In Epipsode 340 of the Iron City Rocks Podcast we are joined by Mr. Big’s Paul Gilbert and Warrant’s Jerry Dixon. Paul joins us to talk about Mr. Big’s forthcoming album, Defying Gravity, which will be released in July on Frontier’s Record. We also talk about his time at GIT, Mike Varney, the mammoth success of “To Be With You”, his solo plans and the possibility of working with Freddie Nelson again. Jerry Dixon talks to us about the bands new album, Louder Harder Faster, which is available now. Jerry also talks in detail about the band’s often overlooked album Dog Eat Dog which will celebrate its 25th anniversary later this year.